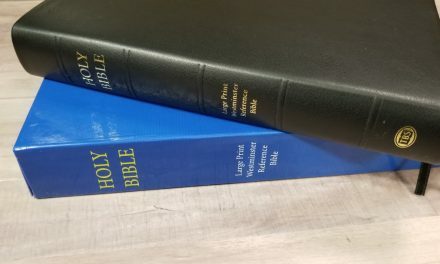 Today I’m looking at The Living Bible Large Print which was released on the 40th anniversary of the translation/paraphrase. Tyndale provided this Bible in exchange for an honest review. I was not required to give a positive review, only an honest one. All opinions are my own. The edition I have is two tone brown & tan LeatherLike with thumb indexing. It measures 9.5″ x 6.75″ x 1.25″ and weighs almost 2 pounds and 3 ounces. It has a sewn binding, gold gilt page edges, and one attached brown ribbon marker. The paper is a nice soft white and is very opaque (Randy loves this paper). We are guessing it to be about 40 gsm. The ink is a consistent darkness throughout. The thumb indexing is the standard curved cutouts with glued on black and gold tabs that work pretty well and are so familiar to most people. The margins are wide enough that these cutouts never cut into the text. 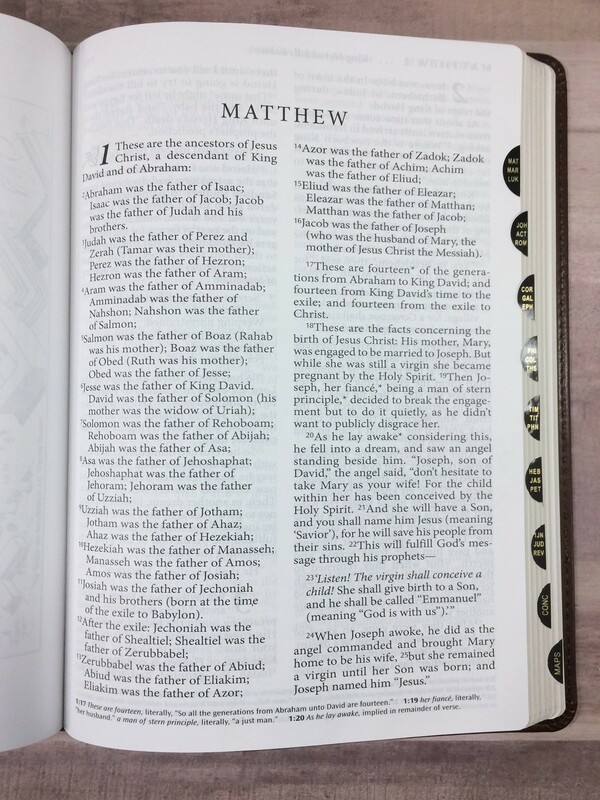 This Bible is also available in a green hardcover and both covers are available with or without thumb indexing. The hardcover is also available in red letter. 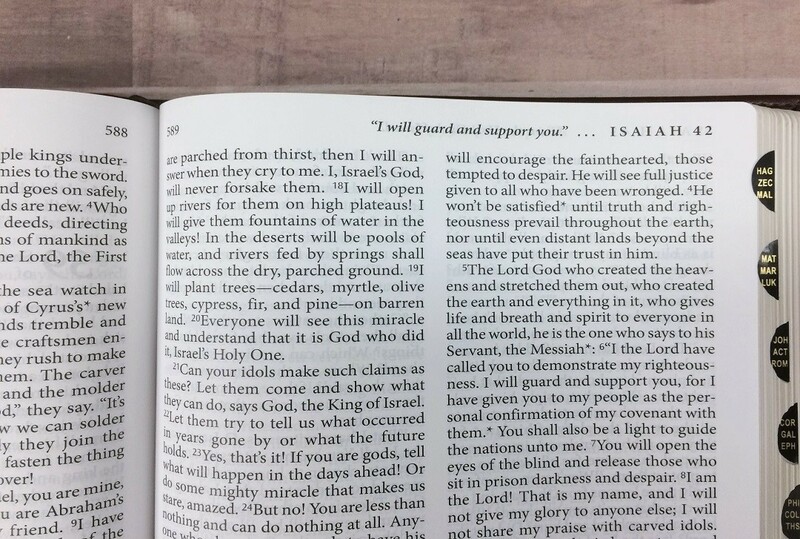 This Bible is set in double column paragraph format. It is black letter with a 10 point font and is extremely easy for me to read. The Chapter numbers are bold and 2 lines high. Even poetry is set in paragraphs. Psalms looks a little odd to those of us used to stanzas. 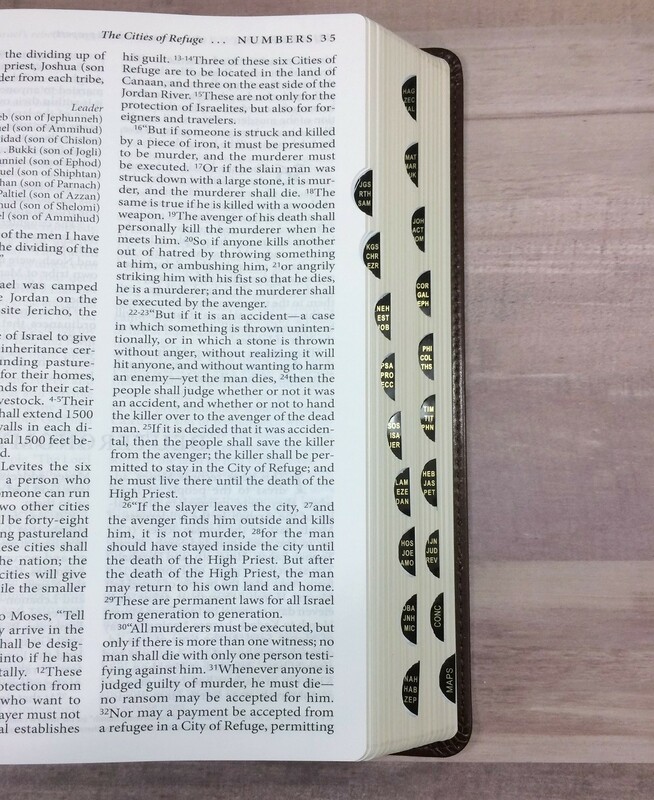 The header includes the page number on the inside corner with the book name and a chapter number on the outside corner. Pages that include multiple chapters have either the first (left side) or last (right side) chapter number. A brief description of one of the most commonly looked for passages on the page is also included in the header closer to the outside corner. Translation footnotes are included at the bottom of many of the pages. These give alternate translations for words or passages and frequently give you the literal (word for word) translation. I really like that they have included these notes. This makes it much easier for those familiar with other translations to see the differences if they don’t have another Bible open. 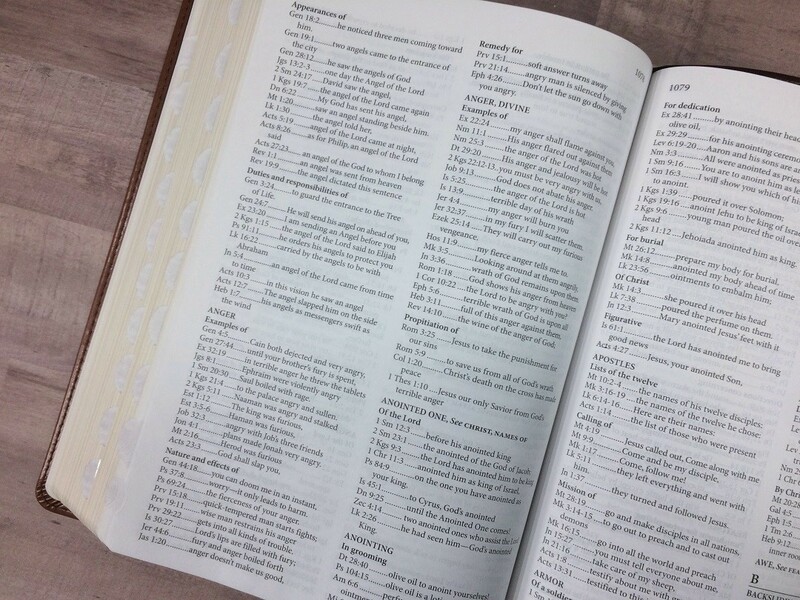 It will also help familiarize those new to the Bible with some Biblical terminology. 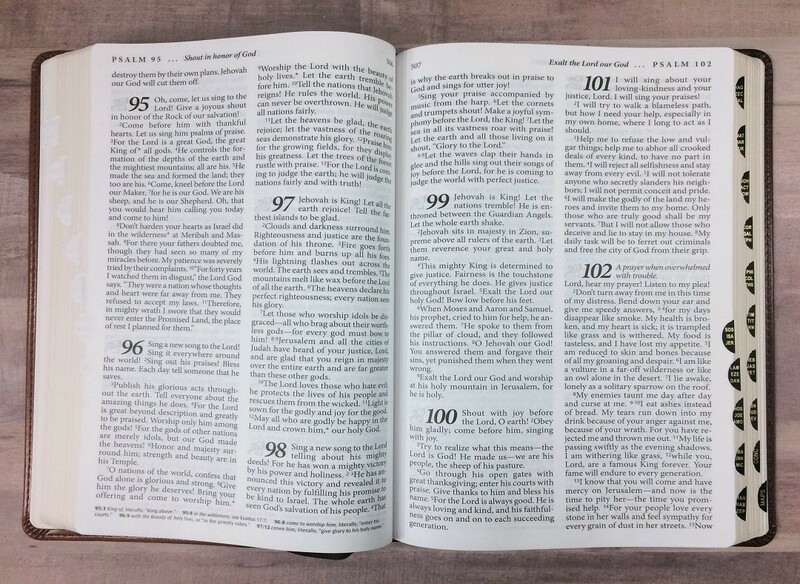 Several study tools are included in this Bible. 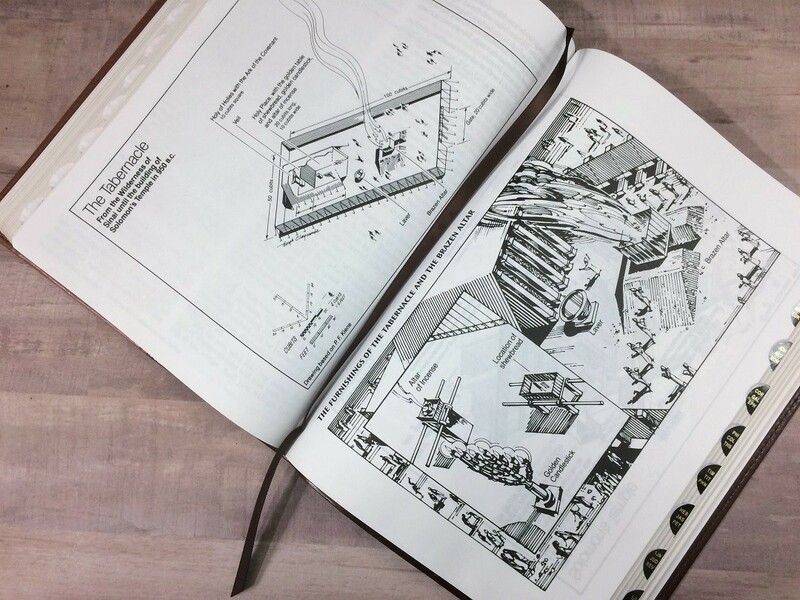 There are diagrams of the tabernacle and both Solomon’s and Herod’s Temples in between the two testaments. It has a year long reading plan. This is not the typical read the Bible in a year plan. This Plan has a short reading each day focusing on the best known stories and most important passages of the Bible. 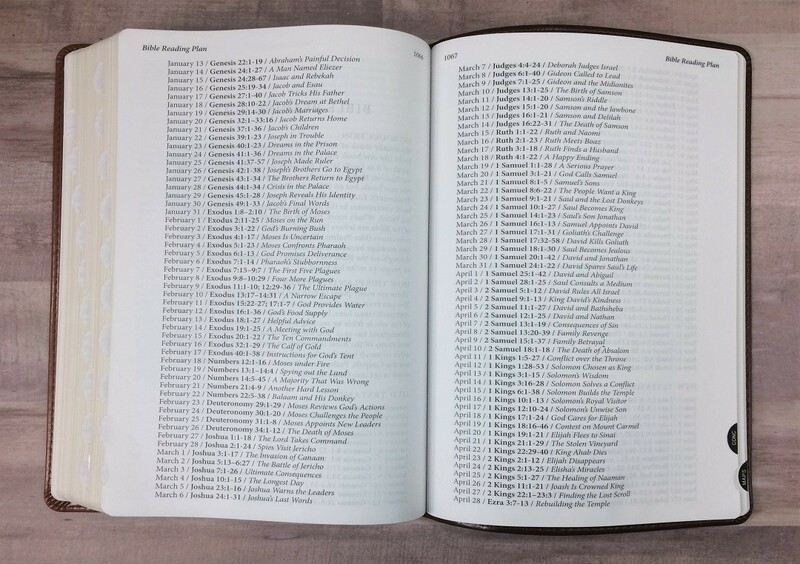 It doesn’t include readings from every book of the Bible, leaving out many of the minor prophets, but this plan would be an excellent overview for those new to the Bible or those returning to reading the Bible. I especially like that they have mixed the four gospels together putting the life of Jesus in chronological order. There is what they call a Topical Concordance. The topics are arranged alphabetically with subheadings under most of them. 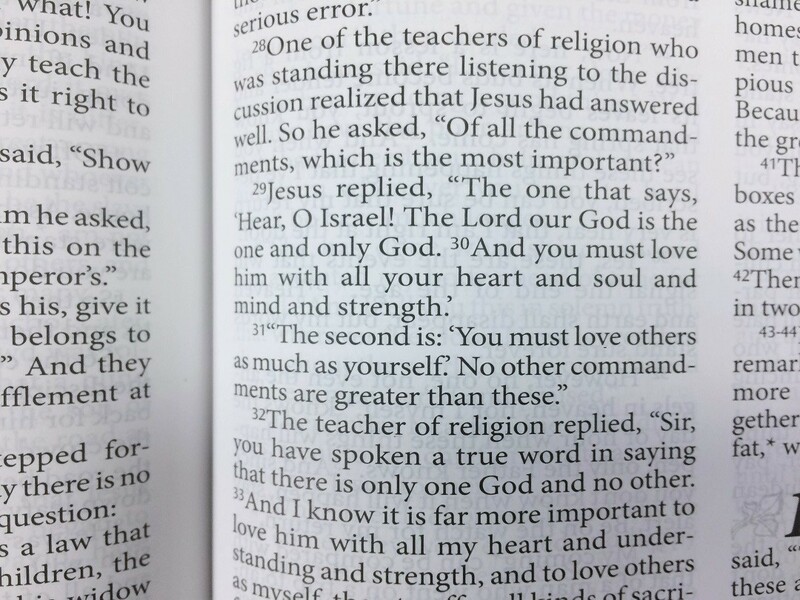 The verses included are always relevant to the topic but do not always contain the word they are listed under. I think Topical Index would have been a better name. When I use a concordance I am usually looking up a verse I’m familiar with to find the reference and I expect all the verses to contain the listed word. As a concordance this is not very useful. As a topical index to help me find relevant passages it is great. Several maps are included. 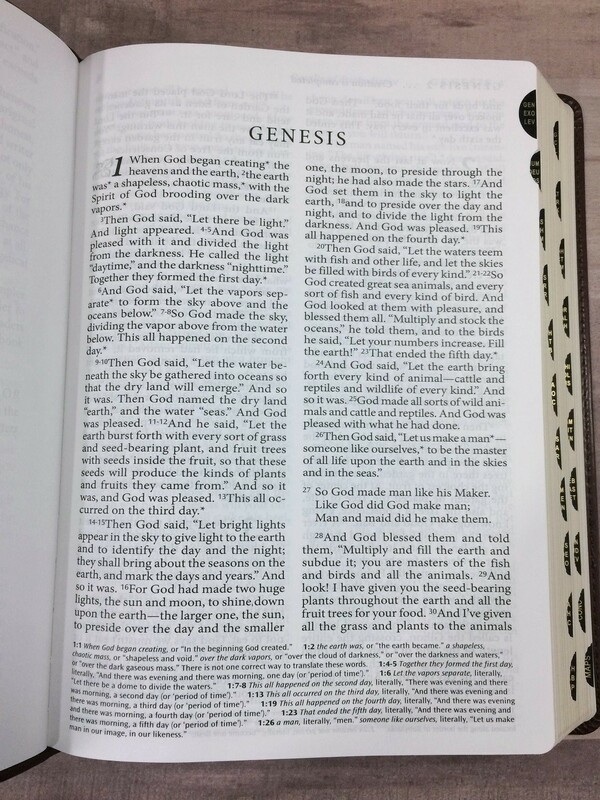 There are two black and white line drawn maps (Israel in Old Testament Times, Israel in New Testament Times) and four full color maps on glossy paper. 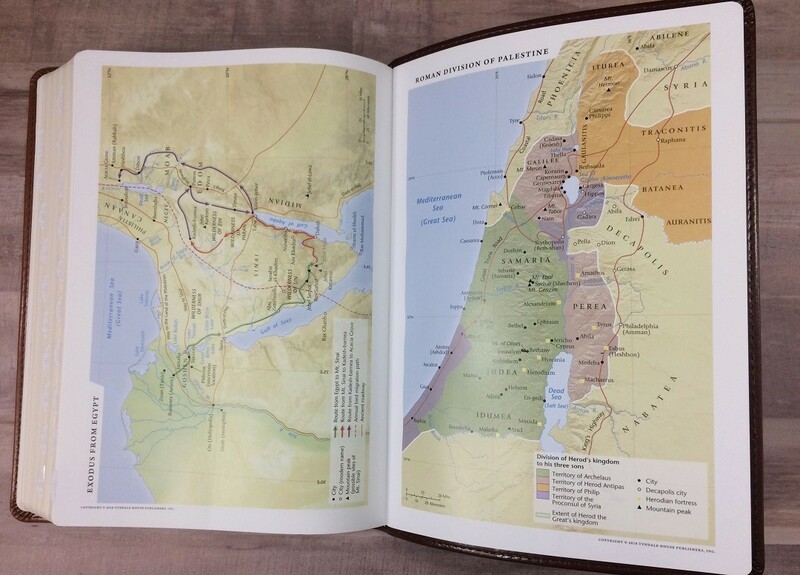 These four maps are World of the Patriarchs, Exodus from Egypt, Roman Division of Palestine, and Paul’s Missionary Journeys. 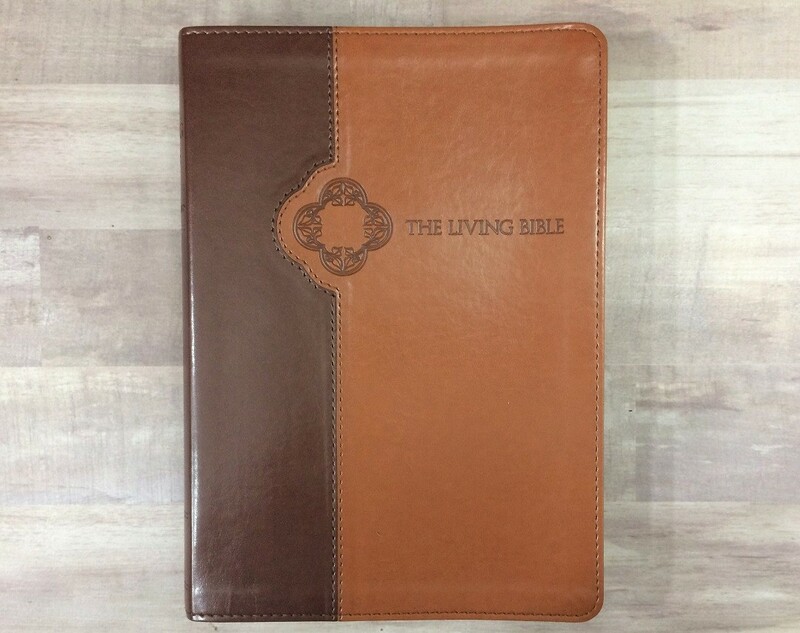 This is The Living Bible (TLB) not the New Living Translation (NLT) that means it is a paraphrase, not a full translation. I don’t recommend anyone read any paraphrase as their main Bible. Paraphrases are great for being easy to read and easy to understand. The problem is that you sometimes lose meaning and sometimes add opinion and interpretation. We believe the Bible is inspired and inerrant in the original language. That means specific words were chosen for a reason. All translations run into difficulty when words have multiple meanings or don’t translate exactly. Paraphrases get around this difficulty by not worrying as much about getting it exact. In a paraphrase ease of use is the goal not exactness, so you use the easiest to understand word sometimes instead of the most precise one. You choose a meaning for a passage and explain it in your own words which will almost always add your opinion about what the passage means. That said, The Living Bible is definitely one of the better Bible paraphrases that exist. 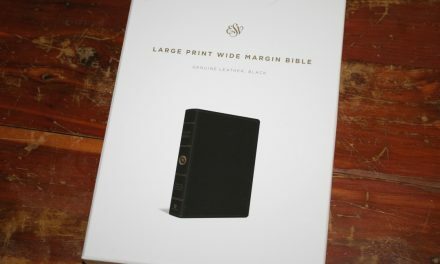 If you are looking for a Living Bible this is a very nice version of it. Thick, opaque paper and a larger font that isn’t crowded make this very easy to read and most of the extra features are interesting and useful. Since it is a paraphrase I can only truly recommend it for use as a commentary, for quick reading to make yourself more familiar with the Bible, or assistance in putting some passages into modern language. 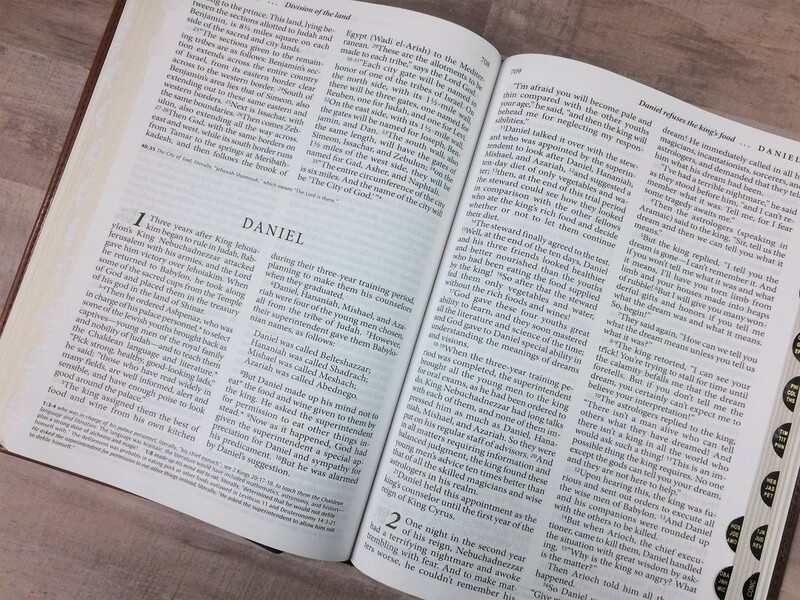 You’ll want to buy a full translation for your main Bible, especially for studying. My grandmother had the Living Bible in the dark green hardback beside her huge national publishing kjv . 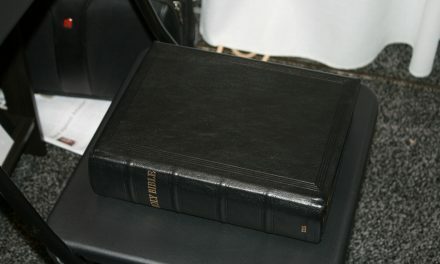 In fact I had a brown hard back Living Bible “Study Bible “ , my mother bought from the Sears and Robuck Christmas catalog. Kenneth Taylor caught the wind on the 1970’s revival through middle America and sold or handed out many of these paraphrases. Looking back, I remember the enjoyment of reading this bible as my own, but the radio preachers and my old preacher used a bible translation called the “New King James Version “, and so do I.